If there's one game that every parent likes to see their children playing it's matching games. Designed to be played from an early age, matching games help develop your child's memory and will sharpen their recognition skills. Jumpin' Jacks Toys has varied selection of different kids matching and memory games that feature everything from butterflies and candy to farm animals and human faces. 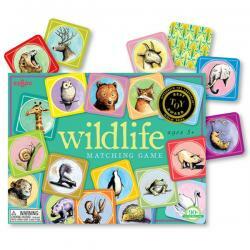 Matching games are a must for all young children. Put your brain to the test!Mudpuppys Enchanting Princess Mini Memory Game includes 12 pairs ..
Picture Word Bingo is a great learning bingo like game designed to assist young children with objec.. Introducing Tiny Polka Dot, the colourful card deck that grows with your child! With 16 easy-to-lea.. It's the tree-topping game that tips the scales when it comes to fun. Players take turns adding the..